Israeli forces were continuing early Tuesday to strike targets across the Gaza Strip, including the offices of Hamas’ supreme leader, in response to a surprise rocket attack from the Palestinian territory. Israel’s military has bolstered its troops and rocket-defense systems in anticipation of heavy fighting with the Islamic militant group. Public bomb shelters opened and sports events and transportation were canceled in southern Israel. The Israeli army said at least 30 rockets were fired into Israel, nearly all of them either intercepted or landed in open areas. Gaza’s Hamas rulers say Egypt has brokered a cease-fire to end the latest round of fighting with Israel. The latest escalation of violence began early Monday when a rocket fired from Gaza struck a home in central Israel, wounding seven people. Israel has vowed to respond “forcefully,” raising the prospect of a fourth war between Israel and Gaza’s militant Hamas rulers. Hamas’ radio station says an Israeli airstrike has demolished the offices of Hamas leader Ismail Haniyeh. The Israeli military says it struck a five-story building in Gaza City that “serves the terror organization’s military wing.” The building houses Hamas administrative offices belonging to the organization’s domestic intelligence agency. U.N. spokesman Stephane Dujarric called Monday’s firing of a rocket from Gaza that hit a house in central Israel, wounding seven people, “a serious and unacceptable violation.” He said the U.N. is monitoring the latest reports of Israeli strikes on Gaza. The Israeli military issued a statement Monday saying the building was “a secret headquarters of the Hamas terror organization” that was used by the Islamic militant group’s intelligence agencies. Israeli Prime Minister Benjamin Netanyahu says his country is responding “forcefully” after a rocket fired from Gaza struck a home in central Israel early Monday, wounding seven people. Hamas’ leader says his group will respond if Israel retaliates too forcefully to an overnight rocket strike. Haniyeh’s statement came as Israel began striking targets in the Gaza Strip in response to the early morning rocket attack, which wounded seven people in a small town north of Tel Aviv. Hamas’ leaders went into hiding, police and security installations were evacuated and hospitals in Gaza were on alert in anticipation of the Israeli airstrikes. Israel’s prime minister says his country has begun responding “forcefully” to a rocket attack from the Gaza Strip. He says Israel will do “whatever we must do” to defend itself. 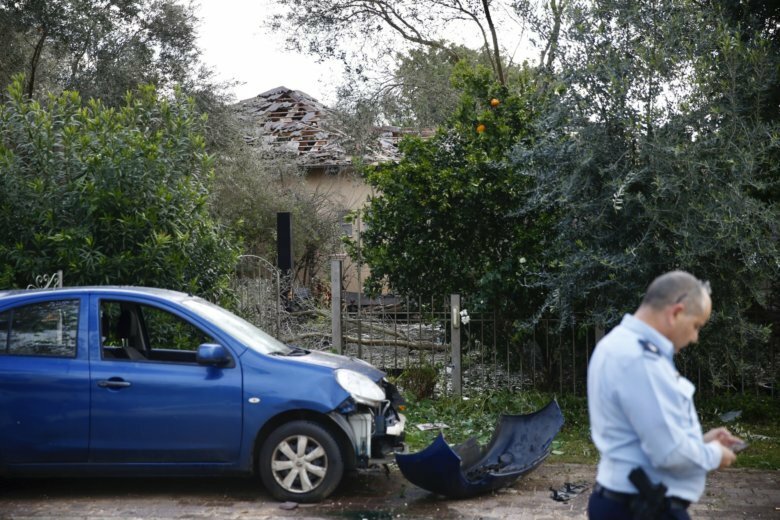 Israeli authorities are taking precautions ahead of a likely military retaliation against the Gaza Strip’s Hamas rulers after a rocket struck an Israeli house, wounding seven. Israeli media are reporting that flights to and from Israel’s main international airport were diverted from their normal flight paths, and train services to several southern cities near the Gaza Strip have been canceled. The Israeli military has also closed several roads around Gaza. Monday’s rocket was the second launched toward central Israel in recent weeks, and prompted Israeli Prime Minister Benjamin Netanyahu to cut short a trip to Washington. Efforts by Egypt and the U.N. to restore a cease-fire between Israel and Gaza’s Hamas rulers have halted bouts of cross-border violence in the past. The Israeli military says it will halt agricultural work near the security fence that separates Israel from the Gaza Strip “to improve readiness” for an escalation after an overnight rocket attack. The military said Monday it would block routes and areas on the Israeli side of the fence and requested that residents “follow security instructions as long as necessary.” Thousands of acres of Israeli farmland lie adjacent to the Gaza frontier. A long-range rocket fired from the Gaza Strip slammed into a house in central Israel and wounded seven people early Monday. Prime Minister Benjamin Netanyahu promised a tough response while Gaza’s Hamas leaders went into hiding, setting the stage for a possible major conflagration just two weeks before Israeli elections. The World Health Organization has delivered medical supplies to the Gaza Strip to address the blockaded territory’s growing trauma and emergency care needs. It cited shortages of medical supplies in Gaza’s stressed health care system, exacerbated by recent hostilities. Close to 190 Palestinians have been killed by Israeli fire during Hamas-orchestrated weekly rallies along the Israel-Gaza border fence. WHO says it’s scaling up its trauma care resources and appealing for funding ahead of a potential escalation and the one year anniversary of the protest movement at the end of the month. A Palestinian journalist who exposed Gaza’s government corruption has been acquitted by a Hamas-run court in the coastal territory. Harb’s 2016 report highlighted misconduct at the Hamas-run health ministry, where healthy people purportedly paid doctors to help them circumvent Gaza’s Israeli-Egyptian blockade by issuing referrals to hospitals abroad. The ministry denied Harb’s claims and urged doctors to file lawsuits against her. Rights groups charge that fair litigation is not guaranteed in Hamas’ judiciary system. Hamas seized control of Gaza from the Palestinian Authority in 2007. She says the military has concluded that Gaza’s militant Hamas rulers fired the rocket from one of their launching pads in the southern part of the coastal strip, near Rafah. She says it was a self-manufactured rocket with a range of 120 kilometers, or about 75 miles.